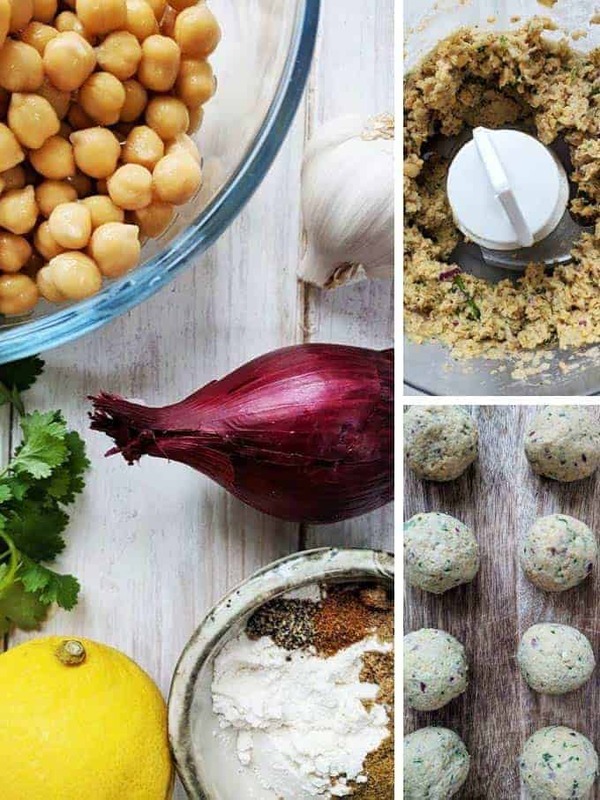 These tasty Falafel are just 1 SmartPoint per portion on Weight Watchers Freestyle plan. Each portion comprises of 2 Falafel. 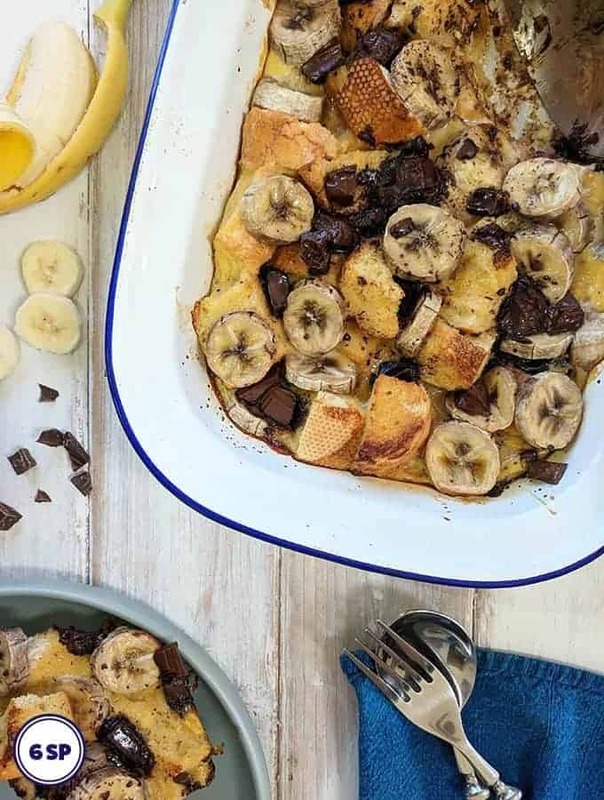 They are so easy to make and can be baked in the oven or can be cooked in an air fryer, whichever you prefer. 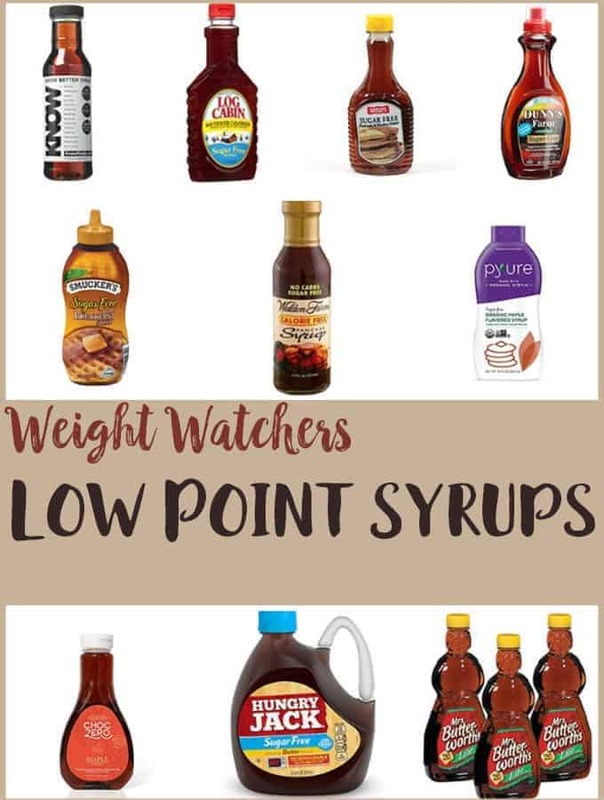 Read on for tips and tricks on how to make these easy low point snacks. 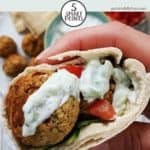 If, like me, you like chickpeas then you will love these tasty, low SmartPoint baked Falafel. You may also like to snack on these crunchy Spiced Chickpeas, or have a serving of this fresh Couscous Salad for a filling & healthy lunch. Or how about trying this smooth rich Chocolate Hummus. Whichever way you like to eat your chickpeas, I think you will enjoy them this way! The recipe makes 8 Falafel and it works out at just 1 SmartPoint for 2. I particularly like them served in a lightly toasted pitta bread, with a bit of chopped tomato and cucumber and topped with Tzatziki sauce! All that for 5 SmartPoints (if you use Pitta that is 4 SmartPoints per bread)! I tend to cook them in my air fryer but it’s just as easy to cook them in a conventional oven if you prefer. Instructions for both can be seen in the recipe card below. I used tinned chickpeas to make these Falafel but a lot of recipes warn you not to do so & suggest that you used soaked dried chickpeas. However, I have found that the tinned ones work out just fine, so I’m sticking with them for ease of use and convenience. This recipe is just so easy. Chuck all of the ingredients in to a food processor and blitz until you get a paste that holds together but isn’t too smooth. Shape the mixture into 8 balls. If you find that the mixture sticks to your hands, dampen your hands with a bit of water first. Try to make the Falafel uniform in size as this helps them all cook evenly. I used tinned chickpeas in this recipe. If you use dried chickpeas, soak them overnight (or as instructed on the packet) and follow the instructions as if using tinned chickpeas. Mist lightly with a calorie controlled spray oil. This helps them crisp up on the outside and turn golden brown. I use a small food processor like this Cuisinart one, available from Amazon, for this recipe. I love serving these in some lightly toasted pitta bread. I partially fill the pitta with sliced cucumber and some chopped tomato. 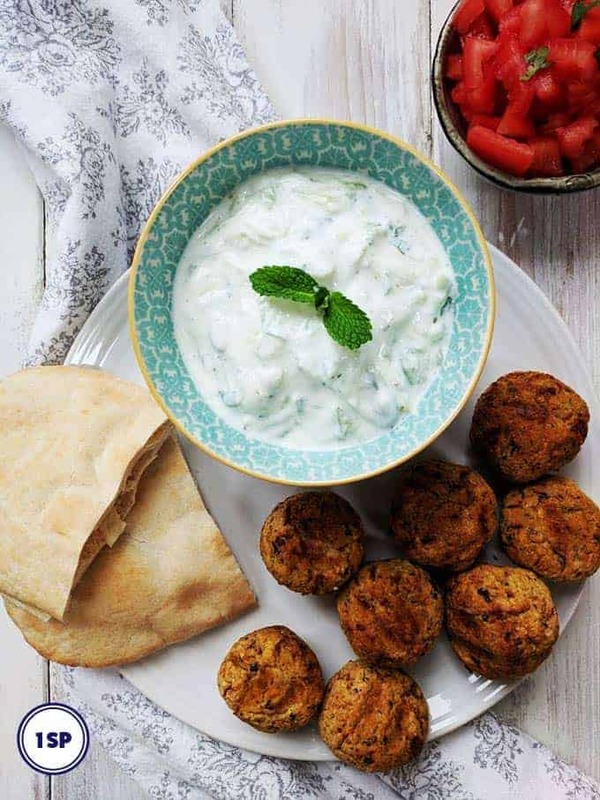 I then pop in 2 Falafel and top with some of this Zero Point Tzatziki. Eat them on their own, dipped in Zero Point Tzatziki , for a very low Point snack. Refrigerate unused Falafel within a few hours of making. Store in an air tight container for up to 4 days. You can freeze them, uncooked, and then defrost and cook as per instructions. If you don’t have fresh coriander / cilantro, you can make this recipe without. Use chickpea flour rather than flour if you prefer. This does not alter the point value of this recipe. 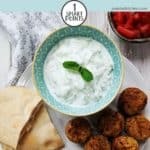 These tasty Falafel are 1 SmartPoint per portion on Weight Watchers Freestyle plan. Each portion comprises of 2 Falafel but you could have 4 Falafel for 2 SmartPoints. Place them in a food processor along with the chopped onion, chopped garlic, flour, salt, cumin, ground coriander, chopped coriander, black pepper, lemon juice and cayenne pepper. Pulse the ingredients together, scraping down the sides occasionally, until you get a paste that holds together but isn't too smooth. Form the mixture into balls. This mixture is enough to make 8 Falafel. 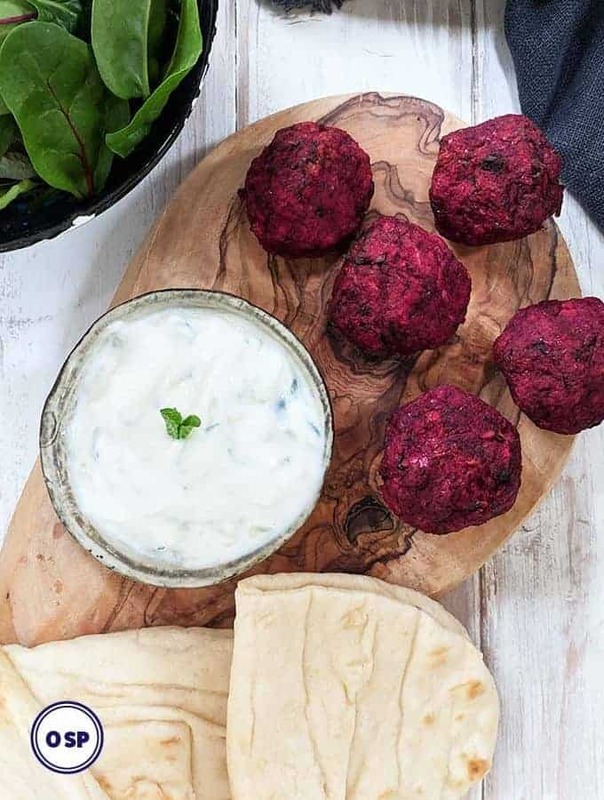 If you are baking the Falafel in a traditional oven, place them on a non stick baking sheet and mist with calorie controlled spray oil. Bake in the oven for 10 minutes, turn, mist with oil again and bake for another 10 - 15 minutes until the outside of the Falafel has turned golden brown. 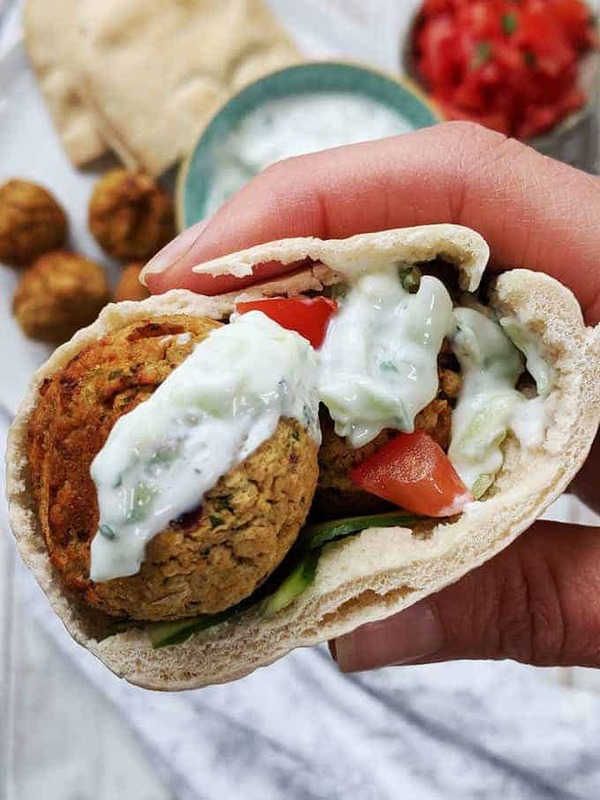 If you are using an air fryer to cook your Falafel, place them into the air fyer in an even layer and spray with calorie controlled spray oil. Cook for 10 - 15 minutes (depending on your air fryer), turning half way through the cooking & misting again with oil. 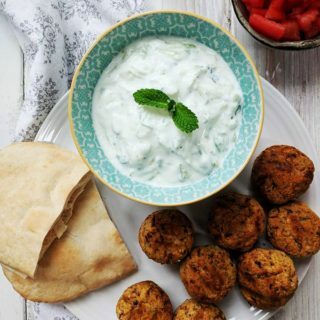 Serve whilst still warm in a toasted pitta bread, with salad and topped with some Tzatziki. Alternatively, the Falafel can be eaten on their own as a snack.